Fashion neutrals are colors that can go with anything, and they're essentials for building any woman's wardrobe. 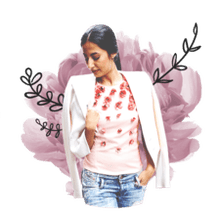 However, just because these hues can go with any other colors doesn't mean that every fashion neutral will look good on any woman, so it's important to identify those fashion neutral colors that work best. So which colors are considered fashion neutrals? Tints (hues with added white) or shades (hues with added black) of these colors also comprise neutrals. For example, grays would include light, medium, and dark (charcoal) grays. Hues such as putty, sand, ivory, medium navy, and tan would all be neutral fashion colors. Keep in mind that these are the metallic colors that are based on real metal, and they do not include colors, such as red or blue, that have been processed to have a metallic finish or look. Much of the time these metallic neutrals are worn as jewelry, but they can also work their fashion neutrality on other accessories, such as shoes or handbags, and once in a while (usually for special occasion or holiday dressing), we may wear metallic clothing, such as a silver shimmer gown or a gold sequin top. Even though patterned hues don't consist of just one neutral color as basic neutrals do, they look enough like neutrals that they can be treated as such in the fashion world. Do Neutral Colors Really Go With Anything? Although I like to say that neutral colors go with anything, and that's theoretically true, some look better than others with certain items. For example, if you're looking for a jacket to wear with a dress that has a colorful print on a black background, a black jacket or sweater will be the best choice. A tan jacket just doesn't have the same panache. However, let's say you want a sweater to wear with a red dress. Any of the fashion neutral colors would work. Although I probably wouldn't wear more than two fashion neutral colors in the same outfit, neutrals can certainly be worn together; for example, high contrast white and navy or white and black look great together and have a sharp and crisp look that's especially appropriate for spring and summer. Likewise, tan and white could make a good color combination that seems especially good for warm weather wear. Unusual combinations of neutrals are also workable and sometimes appear in high fashion; these might include such combos as black with brown or black with navy. An easy way to build a wardrobe is to select one to three fashion neutral colors that you like and that look good on you, and begin assembling some fashion basics in these neutral colors. When selecting your core neutral colors, keep in mind that dark fabrics recede and make the wearer look thinner, and light fabrics advance and make the wearer look bigger. That's the reason that I'm much fonder of the dark neutrals than the lighter ones. The two neutral colors that I rely on again and again are black and navy. I find that almost all my fall and winter clothing will go well with either black or navy or both. In the summer, I still wear some black and navy although not as much as during the fall and winter, and I also add a bit of white and light tan to the mix. 8 Celebrities Who Wear the Same Thing Every Day — And Rock!